Dursley is surrounded by wonderful countryside, nestling as it does under the edge of the Cotswold escarpment at the foot of a valley stretching from Uley in the east through to Cam in the west. It is overlooked along most of its length by the wooded slopes of Stinchcombe Hill to the south and Cam Peak, Cam Long Down and Smallpox Hill (Downham Hill) to the north and east. The area around Dursley used to be referred to as the Southwolds but has since become absorbed into the Cotswolds. Much evidence remains of early civilisations, probably due to the high vantage points and the drier soils. Long Barrows, or burial mounds, from stone age days can be seen all around. Hetty Pegler's Tump near Nympsfield is perhaps the best known and it is possible to enter the burial chamber where a number of skeletons were found when excavated in the 19th century. 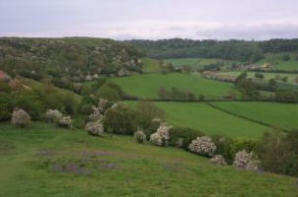 Close by is the hill-top fort of Uley Bury, now a popular walking area. Image produced from Ordnance Survey Get-a-map service. Reproduced with permission of Ordnance Survey and Ordnance Survey of Northern Ireland. The unusual conical shape of Cam Peak is visible close to the north of the town and appears almost artificial in nature although it is in fact entirely natural in origin. Adjacent to it is the elongated shape of Cam Long Down, a flat topped hill providing excellent views across to Dursley, Cam, the Vale of Berkeley, Coaley, Uley Valley and beyond to the escarpment near Nympsfield and across the Severn to the Forest of Dean. From this vantage point, to the south, the tower of Tyndale Monument is clearly visible, a memorial to William Tyndale, the first translator of the Bible into English who was executed for his troubles in the 16th century. Like Dursley, Cam also developed as a mill town and one of the few surviving mills in Gloucestershire is still manufacturing specialist cloth for tennis balls and snooker tables from its factory on Everlands. This was originally the factory of Hunt & Winterbotham but is now owned by Milliken. Other mills which once generated trade in the town include Daniels Paper Mill (the buildings now survive as Middle Mill) and Draycott (Workman's) Flour Mill which was demolished in February 1989. Cam actually now has more residents than its neighbour, probably due to the fact that its growth is not so tightly constrained by steep hills like those which surround Dursley. The Midland Railway branch line once used to meander through Cam on its way to the terminus in Long Street, Dursley. Trains stopped at the only intermediate station in Station Road to pick up and drop off passengers and to serve the extensive sidings behind Hunt & Winterbotham's Cam Mills, the lone survivor mentioned above. Travelling east from Dursley, the picturesque village of Uley is encountered with its fine old cottages of cotswold stone, its village green and its church. Uley was a significant cloth-making village during the 16th and 17th centuries with a large number of its residents finding employment in the cottage industries of spinning and weaving until this went into decline and ceased altogether in the early 19th century. 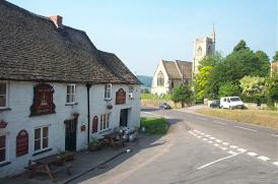 Nowadays, Uley is a much quieter place with a solitary pub, the Old Crown, sometimes known as the Top crown as there used to be another pub of the same name lower down The Street. It even has its own brewery which reopened after a long period of closure 1985 and now provides real ales to the Old Spot Inn in Dursley amongst others. To the west of Dursley, on the road to Wotton-under-Edge, is the village of Stinchcombe, once approached along a fine avenue of elm trees until they succumbed to disease during the mid 1970's. To the north, beyond the hamlets of Upthorpe and Cam Green is the small village of Coaley. The town of Dursley resides in an especially scenic part of Gloucestershire, perhaps overshadowed sometimes by the Cotswold district in the north of the county but just as attractive. It's well worth a visit!